The War of Auto's Electric Motor Lightning Motor news Super Bike LS-218, Fastest Electric World Super Bike. Lightning Motors Corp. is an automotive company engaged in the development of two-wheeled vehicles 'super' with technology-based cell electric alias. For about 6 years, Lightning has managed to create an electric motorcycle that is pretty phenomenal. Currently, a figure of electric and motor bikes from this manufacturer has been sticking its name in the foreign media. 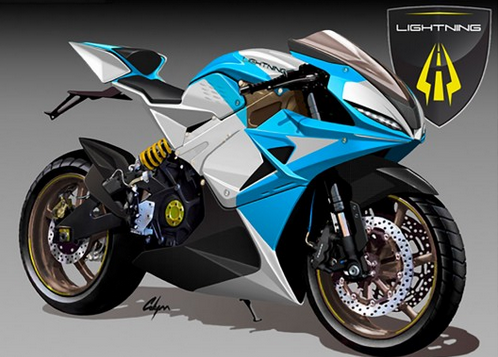 Super bike figure who claimed to be one of today's fastest electric motorcycle given by the name of LS-218 Lightning. Watch the Video of Fastest Motorcycle Electric World Super bike. This electric super bike was US $ 38.888 has scored a record top speed reached 218 mph, equivalent to 350.8 km / h. Strength at yield ranging from 200 hp to the engine speed reaches up to 10500 rpm and peak torque to 168 ft-lbs or 227.7 Nm. By using the power source of 12 kwh, Lightning LS-218 is completely charge the battery has a range of about 160s of kilometers.